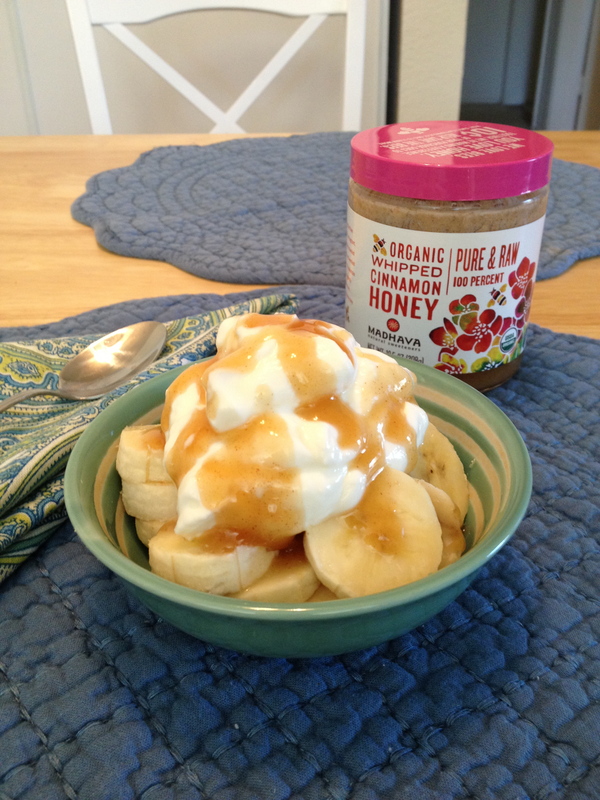 It’s not ice cream, but this bowl of banana, yogurt, and Madhava Organic Whipped Cinnamon Honey ($7) is pretty sweet! I’ve got a sweet tooth when it comes to dairy—I can’t deny it, I love ice cream! Soft serve, sundaes, scoops loaded with chunky bits of goodness, I would gobble it every day if I didn’t know what all that sugar and saturated fat do to your body. (Darn nutrition training!) Luckily, I’ve discovered something that satisfies my cravings and my health goals: A sliced banana and a dollop of plain Greek yogurt drizzled with Madhava Organic Whipped Cinnamon Honey. Honey’s got a health halo—it’s anti-microbial, which means it bolsters your immune system and can keep illness-causing bacteria in check. Still, your body processes it exactly the same way as regular old sugar (insulin spike and all! ), so it’s a good idea to be mindful of portions. I’ve found that one-teaspoon is plenty to turn yogurt into a decadent dessert. What’s your go-to, guilt-free treat?